The most popular picture which Lobster Blogster has ever included is this one of the esteemed Mr George W. Bush. Please enjoy! The lobster finds himself being saluted by a gentleman by the name of Kerron Cross. Kerron is The Voice of the Delectable Left, councillor for South Oxhey and a resident of Croxley Green. The lobster used all the powers that a lobster focussed search engine can bring to bear in order to track down a James Brown duck. Found this at My Rambling Thoughts. A list of 150 key life experiences and all you have to do is bold the ones you have achieved. 104. Survived an accident that you shouldn't have survived. Thanks Louise, I enjoyed that. I won't tag anyone, but if you do do this, let me know in the comments and I will link to you here. There was a real hope for peace expressed by George Bush and Tony Blair when they met recently to discuss the escalating conflict between Israel and Lebanon. 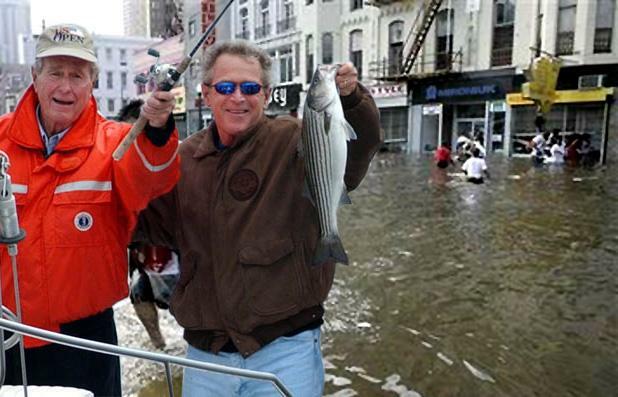 President George Bush and President George W Bush like going fishing when there's nothing else to do. Suppose you want to make an annoucement, but your blog doesn't normally attract a great deal of hits. Suppose you are left leaning, but not too far to the left. What's a good way of making your annoucement? 1. Generate a brou-ha-ha via an anonymous comment (search for Kerron in comments) to a right wing blog (perhaps even chuck a guy on your bonfire to make a big smoke-signal). 2. Lots of fire and smoke gets you talked about. When you know you've be spotted, hide the original evidence. 3. Make you annoucement as planned. If you have friends in high places, they they can ensure the fire is correctly doused. PLUS you are now very well in with the new boss "After Blair Stands Down". - apart from displaying a huge very sad smiley icon with a tear in its eye at the start of post, Mr Cross expresses no emotion about the fact he has been "threatened". In fact he seems quite unfazed when he says "Yeah, I don't think the problem is at my end on this one, but hey ho, there you go." - Mr Cross doesn't actually apologise for what he has done. He stands by it, but has just pulled the post. - The threatening "legal action" is that his foe 'reported me to the Chief Whip under new PLP rules' (both legal and action, geddit?). Of course the lobster could be swimming up the wrong creek, but it was actually the old guy sitting on the bonfire who invented the "threaten to sue" line from Mr McDonnell. No lawsuits are expected to follow what is after all a story about the contents of someone's telephone answering message.